Hello! 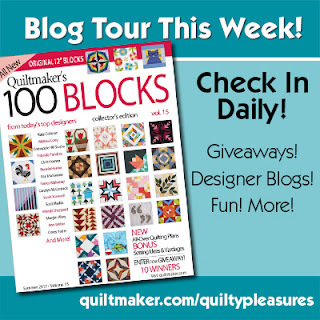 Welcome to the Quiltmaker's 100 Blocks Volume 15 Blog Hop! 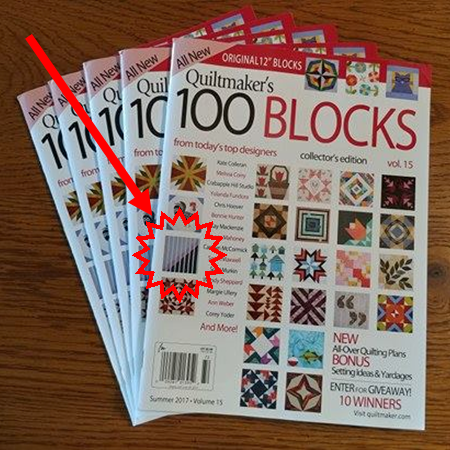 You may remember that the last 100 Blocks issue (see my block from volume 14 here) was my very first print magazine appearance! Well, this time around is my second magazine appearance - and my block is on the cover!!! On the cover, my block appears right above Bonnie Hunter's! That has to mean something. I think I'll just start calling Bonnie my BFF and see how long it takes for her to notice! Ha! My block is on page 52. It is named "Split Mountain" and is block #1484. I made the sample block with solid fabrics in ombre purples and a contrasting aqua. Thanks to the miracle of technology (specifically EQ7), I have played with MANY other color combinations and block layouts and come up with some fabulous quilt ideas! I am always surprised with how different a quilt looks by just changing the colors! This blue ombre might be my favorite! This one reminds me of a 90's skate party! This layout has a completely different look! 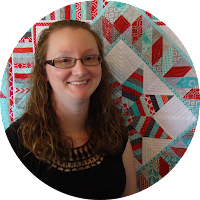 Head over to Quiltmaker's QuiltyPleasures Blog to see all the designers that are participating in the hop! There are giveaways at every stop! Giveaways now closed. Now for the best part! Giveaways! There are actually THREE giveaways happening right here, right now! 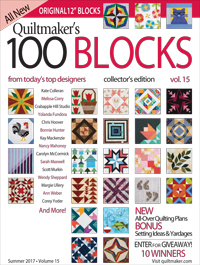 One lucky reader will receive an issue of Quiltmaker's 100 Blocks Volume 14 straight from Quiltmaker headquarters! Two additional readers will each receive a copy of the magazine, five random fat quarters, and a print copy of one of my quilt patterns!! To enter the giveaways, leave a comment on this post telling me about the weather where you live! Giveaways are now closed. I'll go first! We had 15" of rain on Friday and Saturday, in addition to the 6" we got in the 14 days before that! 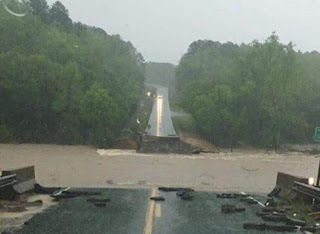 There was severe flooding in our area that washed away many roads and even entire bridges! On Sunday, every road into and out of our county was closed due to flooding and/or damage. We live up on a hill, so we are dry and stocked up on food. However, many of our friends and neighbors have not fared so well. Sunday afternoon the sun came out and the water started to recede, so hopefully there will not be any more rain this week! Giveaway will be open through the end of the blog hop. Giveaway will close at 11:59pm on May 6th. If you are a no-reply blogger, please be sure to leave an email address in your comment! Winners of the giveaways are Beth T. from Oregon, Debbie R. from Kansas, and Katie Y. in Connecticut! Congratulations! 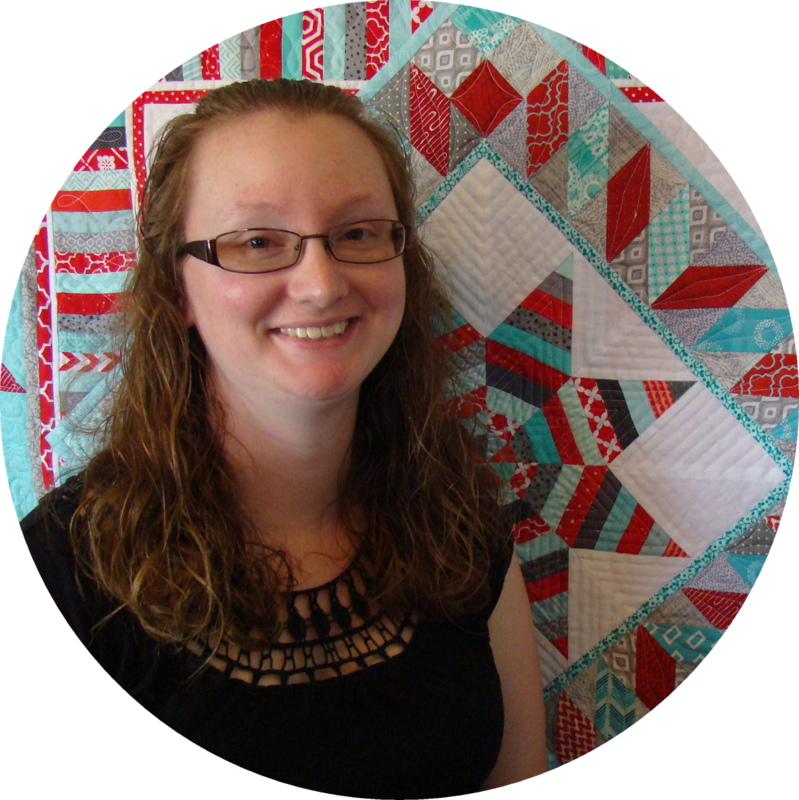 Be sure to follow my blog and find me on Facebook/Instagram/Ello to keep up with my latest shenanigans and quilt finishes! (16 so far this year!) Can't wait to see you there! Oh, and if you stop by Bonnie's blog, be sure to say hello from her BFF, Laura! We had a week of rain but nothing like what you have had. Please stay where you are safe. This past week spring seems to have finally arrived. But...severe storms then cooler weather are coming. I hope you're weather is finally starting to settle! Great block. It sure has a lot of movement. My stomach was moving with some of them. I have a roaring migraine today and you can imagine what those lines and colors did to my head!!!! I didn't see the geese possibility until all of sudden- wham - there is was. Versatility, deluxe. 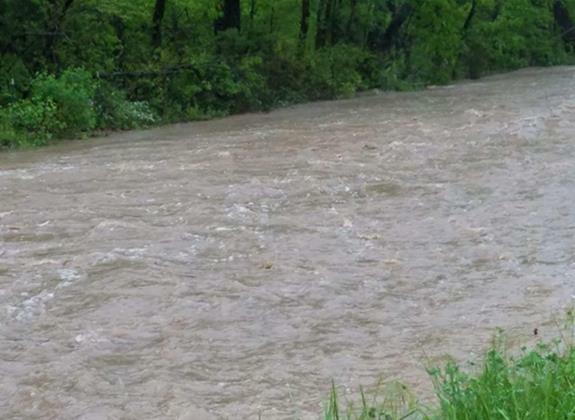 I live in a suburb of Tulsa and we have had rain, rain, rain and more rain and flood warnings. I've been safe and I pray for your safety, Laura. You are officially a cover girl. WOW! If I see Bonnie ever again (which I doubt), I'll tell her I know her BFF. Hoping to be a winner - however, it always works out that the right person wins the giveaway. At the moment it is very rainy and quite cool! Yesterday it was just the opposite. Warm and sunny. Still some april wheather her in Switzerland, lol! Love the blue version! I won't complain about all our rainy days anymore after seeing the flooding you are experiencing! We've had weeks of rain, but not like you!! Hope it dries out soon! Congrats on being a cover girl! What an honor! Nice block, love all the different designs you came up with! I am across the state from you in St. Louis. We got a lot of the same rain you did this weekend, but not quite as much. I think the total from Friday through yesterday was just over 7". So glad it has finally cleared off, but we are supposed to get more rain later this week. thanks for the block inspiration. I love your block, it has so many possibilities. I live in Key Largo, Florida where we have blue skies and lots of sun but summer has arrived, the temps are high 80's. That blue version is my favorite! We have a winter storm warning today, and my son is mad that school's not closed. He just had a day off last week when we had an ice storm. Fantastic block, Laura! In South Carolina we are enjoying a nice spring. Sorry to hear about all the rain in your area, scarey! Your block and all the setting options are amazing! I live in central Missouri and have had about half the amount of rain that you have which is still way too much! And it is raining again this morning. Hope you are able to get roads and such back to normal quickly. I'm glad you are safe. The weather here has been all over the place -- one day in the 80's, the next in the low 60's. It has been hot hot hot here in eastern NC!! Maybe a rain shower tonight. The weather here in MI has been crazy this year also. One day it will be beautiful and high 70's maybe even 80, the next we'll have frost in the AM or high 30's and rain. Today is another rainy day. I really love your block---so many possibilities! Thank you for sharing and for the giveaway Today it is raining. We have had LOTS of rain in the last several weeks, but nothing like what you are getting. I am not complaining though because we really need it. The weather here has been cold and wet. The weatherman said we could see snow flakes this morning.Your block is great with lots of ways to make it. Thanks for the chance to win. We have had a lot of rain as well as windy days. Right now the sun is out and it is so wonderful to see and feel that sun on your face and body. You just seem to be in a better mood and don't feel so confined. Thank you for sharing your layouts with us. This is where inspiration comes into the picture. It is what helps us to design and create. Gets you into the quilting mood. 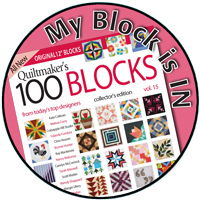 Thank you for being a part of QM's 100 blocks and giving me this opportunity to try and win - Magazine, fabric. OMG . We've had a lot more rain than usual here this year but nowhere near what your area experienced. I'm so sorry for your terrible weather! We are in northern Oregon, and we're experiencing "sun breaks" at last--brief periods where the sun comes out and we all rush outdoors and do anything we can think of that can be done outside, because we're so thrilled to be in the sunshine. I'm told we're expecting actual warm days later this week, but I'll believe it when I see it. Wow! rains and flash floods are no Bueno! I am in Texas ( grew up in Missouri, though ) and we have had TORNADOS! in fact this weekend I was on a bus shop hop and just barely missed being caught in one. I wondered if there were quilt shops in Oz.. It has been rainy here ! I live near Lake Ontario and the level is too high! Lots of flooding near the lake. Fabulous block, I need to make this, probably more than one quilt. Wow--your block is super fun! That flooding is scary---I woke up to snow this morning in MN--no May flowers here! I live in Alberta, Canada and in the month of April we have had rain, snow and a few days with sleet. By Wednesday the temperature is to go up to 18C but we will probably see snow again in May. Congratulations on your block. I love all the different versions of the quilts you showed us. We have had SUNSHINE!!! After a long and wet winter (including 2 floods) it is great to have the sun shine and be able to be outdoors. In fact, I did some ice dyeing (definitely an outdoor activity as it is messy). I love the versatility of your block. Great for the boys and men in my life. Our temperatures have been like a yo-yo. 80s one day, 60s the next. Congratulations! This is a gorgeous block. Our weather has been non-spring like. We have a day of hot sunshine followed by 3-5 cold, damp and dreary days. Forsythia is blooming as is everything else, but not much pleasure in the weather here. I feel for you with the rain and road washouts. Love your block. Sorry about your terrible weather. This week has been variable with rain, wind and sun. Feels like spring creeps in, then retreats. We've been having a lot of rain the last couple of days with flood warnings. We have had rain,rain, and more rain. But, no terrible weather to go with it. Sorry to hear about all of the bad weather you have had. Your block is fantastic! Love how different it looks in each setting. In the last two weeks, we have had high winds, 99 degree to 72 degree and back weather, and am expecting rain by the end of the week. Humidity 8 %. Idiot kids (young adults) shooting flares from their cars into dry brush and starting drive-by fires. Just another day in paradise! Perhaps you could send some rain our way(UK) we only had 4mm in April! We have just had rain here in central Kansas... but on the noon news in Western Kansas 20+ inches of snow!!! crazy spring.. I think the seasons have moved!!! Your block in interesting.. I can see some great options.. thanks..
Southwest Idaho is experiencing some severe flooding too. Our snowfall this winter was one of the deepest in 100 years. The mountain runoff is in full swing, coupled with a lot of rain. Bonnie Hunter follower here too! Your block really presents a lot of variations - love the layout possibilities you gave. Thanks! We've been getting alot of rain too. The dogs and cats are tired of it, that's for sure. And since gardens just got put in, alot of them are under water. We had a gorgeous weekend but started off our Monday with lots of rain. It seems to be gone now, hooray. We've had a few showers today in the UK but the sun has been out and the wind has dried the washing. Much better than last week when it snowed and hailed. I live 25 miles east of Los Angeles, the weather is about 84 today heading into 90 this weekend. Yep...Summer will soon be sizzling away! I LOVE your block! Being a cover girl is pretty cool, congratulations! Great job on your post, too. Luckily we're getting some cooler weather, which I'm EXCITED about, because very soon we'll be passing from spring to summer, and our HIGH temps. Can't stand summer! Love your block, see so many possibilities!! Thanks for sharing!! Our weather has been different here in Michigan with what seemed like lots of rain. My gardens are starting to come to life and I'm ready for the green to emerge!! Wow, have you had the rain! Hope everyone near you is surviving it. Last Friday we had a day where it was foggy at 7 am, clear blue sky by 11:00, raining by about 2:00, and snowing by 7:00. Crazy spring weather! I love your block! Thanks for the giveaway! So sorry about all the terrible weather and destruction you've had where you live. Here in Maine we think Mud Season is over and, although the mountains are getting snow this week, we will be having a lot of rain along the coast and temps in the 50's. So maybe the daffodils will survive! Love your design! we've had a fair bit of rain and the temperature has been up and down. It's been a bit colder than normal but it will heat up for a couple of days and then get cold again . It's a bit crazy making. I love your block and the different layouts. Love the optical illusions and movement of the design created by your block. It was a Sunny day here, but I work inside all day so missed it. Thanks for sharing. We had a weekend of rain (central KS) but further west of us had over a foot of snow. I can't imagine having that much rain! 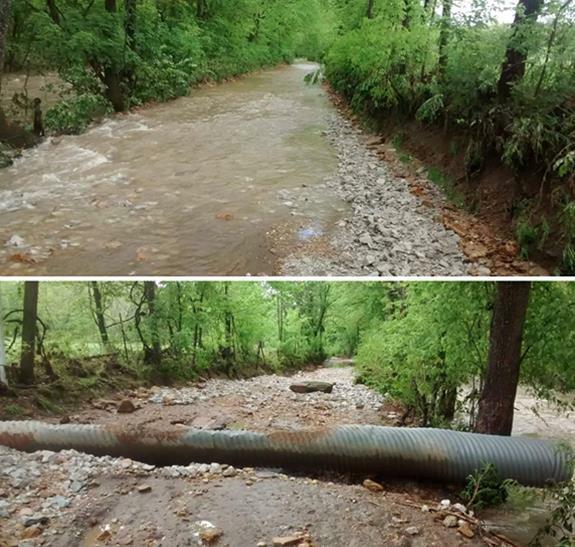 Our weather has been warm and rainy on and off, but no flooding. 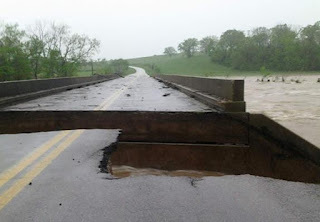 I saw on the news about all the rain and flooding in MO, I hope things are drying out now. we've had some rain, but really warm temps (70's!) over the weekend. Friday evening was gorgeous, but then Sunday was in the 40s. It's cool how different layouts of your block look completely different! 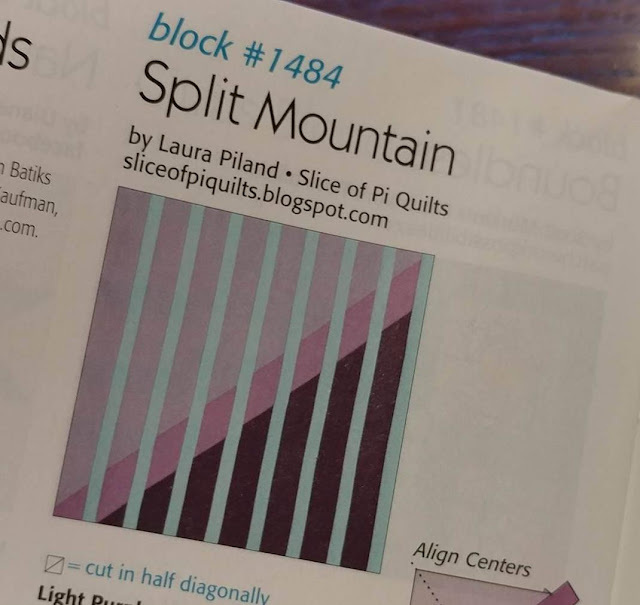 Congratulations on making the cover with your Split Mountain block! So sorry to hear about the flooding in your area. The weather here is mild and sunny. Thanks for the great giveaway. We had very nice weather on Friday, but since then it has been pretty gloomy and rainy! Cold and rainy here in Wisconsin; we even had snow last week. Hoping the sun finds its way north soon!! Your block has a ton of possible layouts which makes it much more interesting. Congratulations on being a cover girl! Your block is very unique and so are the quilt layouts. Weather here in Florida has been warm but sunny. I'm really enjoying the weather. Our weather has been crazy. One day it's 80, the next it's 60, rain on and off. Hopefully we'll have some nice Spring weather soon! Congratulations!!... How exciting, to be on the cover! We have had a lot of rain here in Michigan, too... But NO where near the amounts, and the flooding you have had!! We've been RVing in AZ for 10 days. First couple of days, the temp hit 98°, then windy. We're farther north now and it is gorgeous--sunny and cool. Love your block, Laura! Right there on the cover! Yay! Here in Minnesota we had snow one day last week. Otherwise we've had 4" of rain in the past two weeks. A bit soggy, but nothing like you've had. First of all, I love how versatile the pattern is. So many choices. As for the weather, well lets just say that it can be winter one day, summer the next, tornado's the next. Recently the weather has changed so often you can't tell what season it is. Love your block, and all the great settings you show. The blue ombre is definitely my favorite, too. Our Spring has been very wet, with a lot of flooding, too. Quite a bit of our back yard is still under water. The weather has been variable here in the Chicago suburbs--sunny, windy, torrentially rainy, sprinkles, clouds, and cold. Typical midwestern spring. Purple and aqua are my favorite colors, individually and together in quilts! Thank you for showing color and design options. April spring weather is crazy here in Utah, USA. We've gone from freezing, to rain, snow, sleet, hail, to nearly 80 degrees. Sometimes in the same 24-hour period. We're a high mountain desert, so we can have huge temp swings from day to night. Sixties in Utah today, but I am excited for the weekend! High seventies and sunshine! Great block! We had lots of rain & flooding last week. This week started out hot & humid - felt like July instead of May. Hoping Spring comes back. Thanks. I am located near the Hill Country of Texas (San Antonio area) and the weather here is cool at nights (50s F) and HOt during the days (high 80s and low 90s F). We get the occassion Thunderstorm; but, it's mostly dry and sunny these days causing me to have to water my garden frequently. We have had a lot of rainy dreary days but not a lot of rain like you. I just want to see sunshine and warm days. Your block is very cool! I live in east TN and the weather is amazing. Skies are crystal blue and it is warm outside. Please be safe in all that water. Water is so dangerous and so many people dont realize HOW dangerous until they see roads gone. Praying for you and your neighbors. Sunny and dry in south Texas. The southern edge of that storm system just touched us one night and was gone. We are having a lot of rain here, but not as much as you have gotten. Take good care. The blue ombre one made me go "Oooohhh!" :) Here in Cincinnati its cool and breezy--more rain on the way, but we get a breather! Love the block and the different ways to lay it out! We had "SNOW" this past weekend here in NW Kansas. I spent the weekend quilting until we lost power, took a nap then back to quilting when the power came back on 3 hours later! It is COLD that is all anyone needs to know! We had a very brief warm spell (60s) that did not last long enough. I am so ready to walk the dog without hat, gloves and winter coat. Spring here has been cold with rain and then hot days. We have had changes in temperature sometimes 10 degrees from one day to the next. Howdy from sunny,warm South Texas! Not too terribly hot yet, nice cool evenings, great for Fiesta time. I like how versatile your block is! Congrats on being a cover girl, your block is awesome! I am in upstate South Carolina and while we have not had to deal with flooding, we had a huge hail storm a few weeks ago and I now have many holes in my siding and roof. Wow! We have had some rain the last few days but nothing like you have had. My basement seems to have a continual stream going through it.Looks like you may need a boat to travel down your road. Love your block and the variations you have shown. Thanks! Your flooding pictures are pretty impressive! We have nothing like you. I'm in central Ohio and it's chilly here (low 40s). We've had rain for 2 days, but nothing like yours. Today is hot 85* here in Ga. We had rain yesterday but the plants say water please.Two weeks ago we got 4" of rain in a few hours. We had a flood in the backyard but you would not know it now. We need water but not in a flood, so I know and understand flooding. When I see your quilt I think about the quilt I made using music fabric. It was fun but keeping true even strip was hard. It has been a very rainy week here in NW Indiana....and more to come this week and weekend. I'm expecting LOTS of May flowers coming up!! I love your quilt block! That is a lot of rain! We have had a little rain and a smattering of snow here in MIchigan - it was 45 degrees out today and chilly. Great block! I live in Riverside, California and the weather has been in the 80's and 90's. But that is the perfect excuse to stay inside and quilt. Great block. I love blocks that can be arranged into different designs. I love the blue ombre version. The weather in the Pacific Northwest has been rainy and dreary most of the time from October till now. The sun has been out but not very often. I live by Puget Sound and have watched the rain squalls for months. That's a neat block. I love how you've shown the different quilt layouts using it. As for the weather, it's been a mixed bag here in the Pacific Northwest. We've been in the mid-40s to mid-60s with rain, sun, hail, and whatever else gets thrown our way. It changes by the minute. 15" of rain!?!?! wow! It's a beautiful sunny day and 71 outside. Spring is late to arrive to North Central Washington state this year. We are a good 10 degrees below our average temps for this time of year. I love your block and how the pinwheels kind of look like they are underneath the lines. We have had a lot of rain here also. 2 days ago the storm was so severe there are still people without power. Stay safe! Our weather hasn't been anywhere near as dramatic. After recoerd highs in April, today was sunny and mid 70s. It was rainy and chilly this morning. Typical Pacific Northwest weather. But, this afternoon the clouds disappeared and the sun came out. By early evening the temperature was in the low 70s! Oh my goodness, take care of yourself and yours. We are having rain too. Took me several hours after my walk to get warm again. We still have a fire in our wood stove to keep the house warm. I love your block...it reminded me of going up the stairs in my parent's house so many years ago...they had a railing and so I loved your block for the memories. Thank you so much. We are moving into winter in Australia but the weather here has been lovely. It is mild, not hot or cold with a little rain at times. At the moment it is a lovely still afternoon. I am enjoying it while it lasts. It can rain a lot here too for weeks although not so much that roads wash away! Love your block and the quilt options. We are having lovely weather in Wisconsin and hopefully it will be warmer soon. I think it is frightening to see how quickly a rainstorm or tornado or other weather phenomenon can change our lives. Goodness! What nasty weather you have been having! We are cruising into summer here--64 on Monday, 71 on Tuesday, 83 yesterday and 91 today! No rain--high desert here. Glad to hear you're safe and dry. The damage around you looks so extensive. Never really thought about floods and pipelines until I saw one of your photos. Hope the cleanup goes well. By the way, love your modern block. What a great idea to use Ombre. Yikes... when I first read the prompt I was going to say chilly and raining, but I think I should change that to drizzling. Nothing like the rain you've had... stay safe! Amazing block!! that weather is headed my way friday and sat, I'm staying inside. Congratulations Covergirl! :) Weather here is cloudy and rainy and colder for this weekend. The perfect weekend to stay in and sew! Weather here is cool and pouring rain. Perfect curl up with a quilt weather! Aloha! It's hot and humid in Hawaii today. There are no tradewinds today so you can feel the humidity more. Otherwise it's a gorgeous day in paradise. In Montana this week we have gone from temperatures in the 30's to temperatures in the 80's. Wow! We've had some rain, but nothing like that. Getting ready for our hot summers and 3:00 showers here in south Florida. PA here, and raining cats and dogs. Had tornadoes nearby on Monday. Rainy days are quilting days! Here in Nebraska, we had a little snow in early May--Today we are enjoying nice 70's degree temperatures. Sun has been in and out today...after a rough weather night last night...storms, a confirmed tornado. Flooding is still continuing downstream from us from the last torrential downpour. We are having one rainy spring as it looks like you are. Any day of sunshine is greatly appreciated. I must admit though, I like to sew when its raining, but this is a bit too much, if you know what I mean. The weather, ever changing, popular topic for sure. 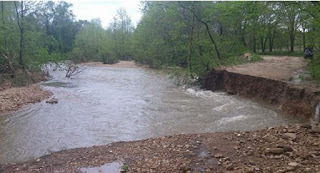 We are expecting torrential rainfall starting tomorrow, we had the same thing as you did, last year, lots of roads washed out and no electricity for a couple of days! but summer is on the way and certainly looking forward to it! Southern Indiana has been gloomy, rainy, and cold! YUK!! Yes, lots of rain...but our grass is so green! coming up on Monday night, we have a low predicted of 29! And I had just bought all my annuals to plant tomorrow. I'll just have to get them done and cover them up. After a long snowy winter and rainy spring we have finally had 2 nice days in a row. Maybe spring is finally coming to Montana! I recently moved to Gresham, Oregon, and we have had the wettest weather in a long time. We have had rain, sleet, snow and even hail, which is incredible for this time of year. Today it is sunny and mild with a few clouds. Just beautiful! Finally the fog is gone! Wow that's intense! I live outside of Philadelphia PA. It's my ideal weather. All 4 seasons with mild winter, lots of sun but not too hot in the summer, and plenty of outdoor greenery to enjoy! Best of luck with the rains and repairs!